Feather your nest with beautiful furnishings and accessories to make it as unique and individual as you are. Update your own stylish look with accent tables, side tables, console tables, mirrors, lamps, shelves, vases, trays and other decorative accents. Notable makers include Split-P, Park Designs, Fringe Studio Glass, and more. 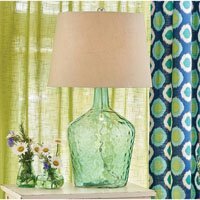 Unique, stylish, affordable pieces for your home - the perfect accent table, a hanging shelf to bring order to your entryway, a shapely lamp, an artful vase.